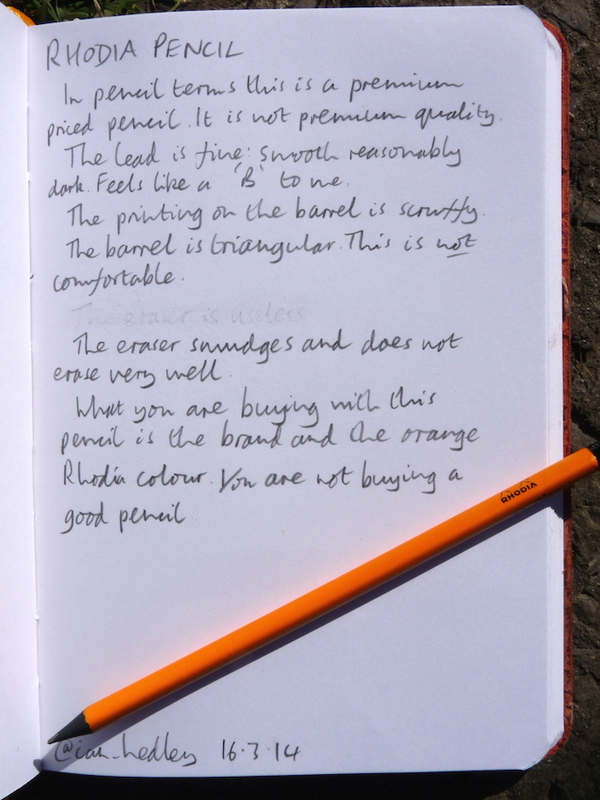 Rhodia pencil review – Pens! Paper! Pencils! Those of you who have spent more than a minute looking at this site will know I rather like Rhodia notebooks. They are the notebooks by which I judge all others. If any of you have spent more than two minutes looking at this site you will also know I rather like things that are orange. So how could I not like this bright orange Rhodia pencil? Read on to find out! The first mark against this pencil is a purely subjective one. It’s triangular and in my big fat fingers that is jolly uncomfortable. Even writing just the handwritten part of this review was awkward. People with more human sized hands may not have this problem. The printing on the side is a little scruffy and on one of the two that I have is smeared. The lead itself, though, is fine. It only comes in this one hardness and I say this is about a ‘B’. The eraser doesn’t erase the pencil. 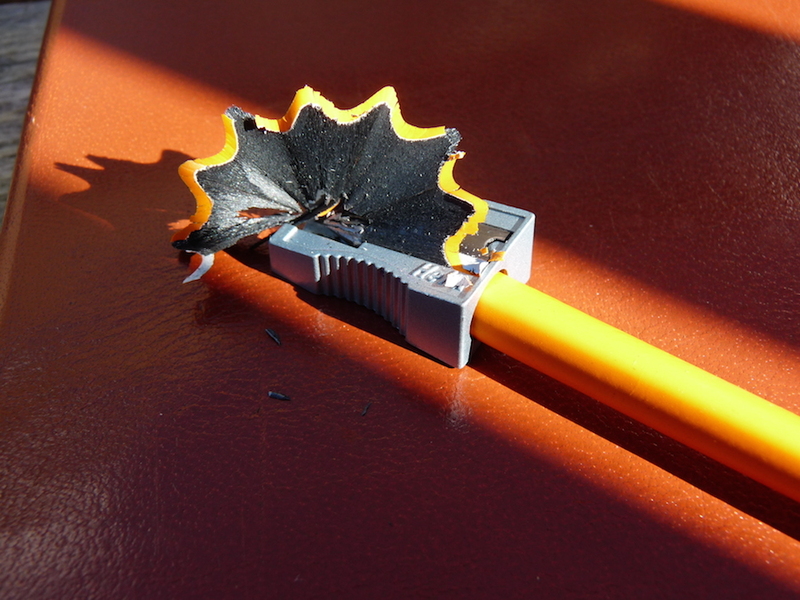 I know this is a common complaint with all kinds of pencils but this one is particularly shocking. It seems to take away the paper underneath whilst leaving most of the actual pencil mark behind. This could be a miracle of technology but it doesn’t suit a pencil. 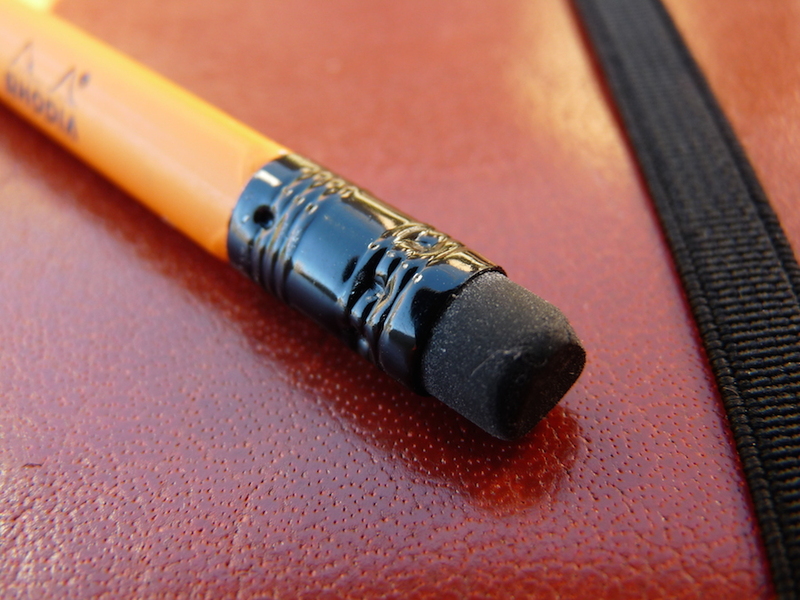 This is a pencil with a terrible eraser, lazy branding and an uncomfortable grip. 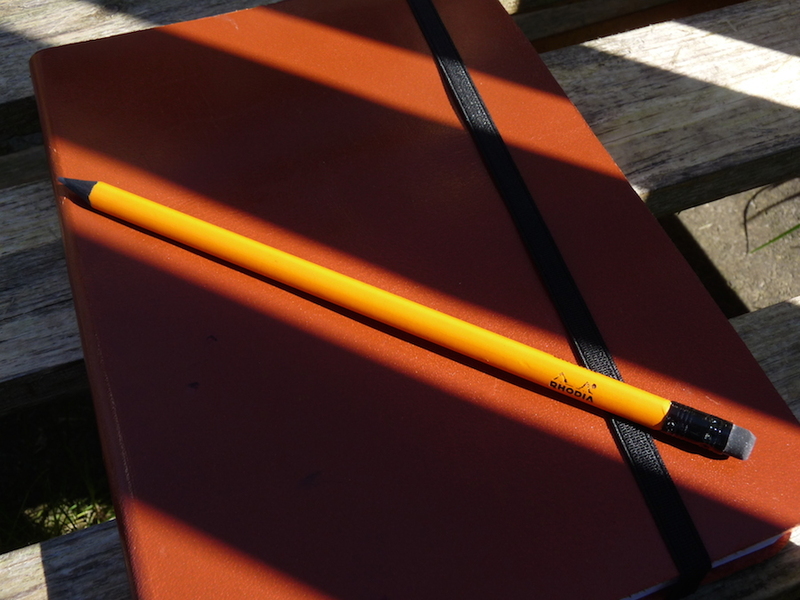 The Rhodia pencil is a premium priced pencil but it is not a premium pencil. Ian– very good to know. I have been lusting after these orange pencils because of the fabulous quality of the paper, but I have been hating the price tag. So now I can put away my desire for the orange pencils. Thank you. I’m glad it helped. I’ve tried several other pencils over the last few months and will put reviews of more up but I’ve not found any (yet) that are better than the Tombow Mono 100s. Ian, people are going to look at your gorgeous photos and still want Rhodia pencils. I agree, they are pants. 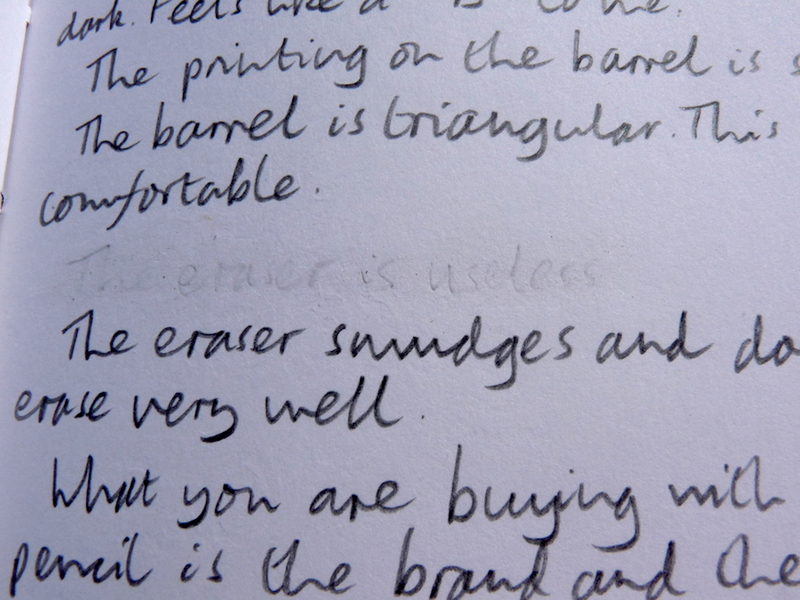 Like Moleskine’s hokey square pencils, they are a ridiculously expensive exercise in brand extension. Also agree Tombows are the shiznit, as are Palominos Orange and Blue, Hi-Uni’s, and Blackwings. I look forward to more pencil reviews. Thanks re the photos! I’m hoping to have a review of the Hi-Uni up soonish. I also tried a Rhodia pencil I got in a box of Rhodia pads. It was the most awful pencil over all I have ever tried. Pencil was not good, eraser though, how does anyone make an eraser as bad as that one?